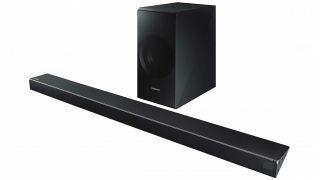 Most soundbars have cinephiles in mind, from simple two-channel stereo set ups looking to beef up a flatscreen TVs audio output, to the more impressive sound-bouncing Atmos variants. But Samsung's new HW-N650 has a different audience in mind – gamers. At first glance it looks like a standard soundbar-and-subwoofer pairing. But look a little closer and you'll see that the HW-N650's main speaker unit sports a unique wedge-shaped design. Underneath its casing sits a tube-shaped sound port, nestled between dual tweeters on its sides. Where things get interesting is in the way it uses an array of holes along this surface to shape the soundstage – allowing for "highly directional acoustic beams" to really direct the sound according to the action on screen. The idea is that individual sound elements in a game – from the position of enemies to the directional nature of voices – will be better represented, letting you rely on the soundbar for competitive play as well as you could with a surround sound headset. It's certainly an interesting concept, but as ever the proof will be in the actual hearing. The N650 will hit stores in April, priced at $499. With Australian and UK pricing and availability to be announced, expect somewhere in the region of £499 and AU$1,000.